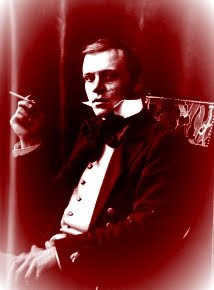 Hanns Heinz Ewers (1871 - 1943) was many things: philosopher, Diabolist, nudist, nationalist, Decadent, mystic, drug fiend, actor. But beyond any of these, Ewers left his most indelible mark on the world with his strange and grotesque fiction. His 1908 story "The Spider" and 1911 novel Alraune are considered classics of Horror. Yet the weird life of Ewers, coupled with the cultural climate of his beloved Germany during the 1930s and '40s, resulted in Hanns Heinz Ewers coming dangerously close to being erased from history. As Don Webb wittily observed in his 1999 essay "The Dark Side of Wonder": "Adolf Hitler, Aleister Crowley, Dashiell Hammett and H.P. Lovecraft all agreed on one thing: Hanns Heinz Ewers was a scary guy and a talented writer. But the first name on that little list is the reason you have never heard of him." Yes, HHE was Hitler's favourite author. This led to great boons for Ewers in the early 1930s...until the Nazis concluded that his romantically Satanic vision and rather liberal views were ill-suited to their cold and increasingly constrictive laws. And just like that, Ewers was blacklisted. His books were banned and burned and the author himself had to go into hiding. Had he not snuck his personal collection of writings to the the Dusseldorf City and State Library he may well have disappeared from history altogether. As it is, only a fraction of his writings survived the blitzes. Ewers was in the wrong place at the wrong time. His ties to early German Nationalism were loose enough to have him branded "decadent" and undesirable when the Third Reich was born and set out its agenda of hate and destruction, yet these same ties were enough to damn him to post-WWII generations. His life was so bizarre that it often became entangled with a twisted distortion of the political facts. Thus he has often been erroneously branded a Nazi. (It is worth noting that these dismissals conveniently overlook the fact that he was openly opposed to the anti-Semitic views of the Third Reich and that he actually aided the escape out of Germany of many of his Jewish friends). But those surviving tales are golden. The political distortions of Ewers's past are slowly being straightened, and his work has been enjoying a redivivus over the last few years. Runa-Raven Press brought the first Engligh-language collection of HHE's work in decades, Strange Tales, into print in 1999, and now, thanks to the efforts of John Smith and the indefatigable Joe Bandel, a wonderful new line of Ewers books is surfacing. Probably the most gratifying point I can add to this Ewers resurgence is that Side Real Press is preparing a tribute anthology to Ewers. I am very proud to announce that my own Ewersesque tale "A Pallid Devil, Bearing Cypress" will be included in this book. HHE's work has had a profound impact on me as a writer and reader. I am very moved to be able to pay tribute to his legacy in such a way. "I am a king. I am a god. I create. I create a great and strange world."